Meet “Just a Walk in the Park”. 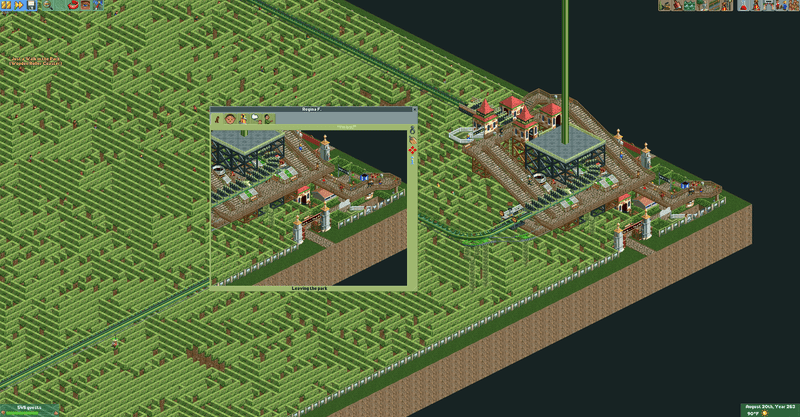 It’s a theme park built in an open source version of Rollercoaster Tycoon 2 with mostly one attraction: a maze. A maze so large, so hellish, that it took a single NPC 263 in-game years just to get to the exit. Back in February, RogueLeader23 uploaded a theme park that doubled as a nightmare. The nightmare was for the NPCs who entered: once they set themselves on the path to RogueLeader23's maze, they would never get out. The maze is so large, so convoluted, that guests get lost upon walking into the entrance. The first experiment: Beverley P, who initially spent five in-game Rollercoaster Tycoon months just searching for the entrance. RCT2 - or the freeware variant Open RCT2, which RogueLeader23 transferred his park to - only uses an eight month calendar, meaning poor Beverley had spent over half an in-game year just trying to get into the maze. Other guests were added to the park later, eventually growing into the hundreds. Being the first, however, Beverley continued to wander the Maze of Doom. Checkpoints were established in the maze, which only made things worse: upon hitting the first checkpoint, guests would be presented with multiple pathways to freedom. It took 53 in-game years for a guest - not Beverley - to find the first checkpoint, God bless. And things didn’t get easier. Look at poor Jan’s prize at inching closer to freedom; it’s no wonder they were stuck in the same area for 15 in-game years. 100 in-game years passed, but no park guest - or sacrifice, as RogueLeader23 described, had made it to the third checkpoint. Mazes within mazes. Good God. But after 263 in-game years, one of the first sixteen entrants into the park finally escaped. “ Seen just outside the maze’s exit, Regina is currently boxed in in order to be interviewed and checked by a medical team. She has only been muttering the words “I can’t find the park exit” and “I have the strangest feeling someone is watching me,” the park’s creator, who sounds like he would be friends with Amanda, wrote in the latest update. It’s not the end of Just a Walk in the Park yet - another update will be posted when, and if, Beverley makes her way to the end. She’s apparently given up hope, which sounds pretty reasonable to be fair. It’s been a bloody long walk.